.... humanity will have long since established its own habitat network. Once established, these enterprises will exploit their geo-spatial relationship for further commercial gain. For example, habitats Alpha and Omega will likely be conducting commerce with Terra as well as each other. They don't mind expanding their opportunities by trading with the Martian habitats. Points 1 thru 5 all reside on orbit of Mars in a predictable pattern. Unique distinctions are described below. Mars first appears out of thought experiment’s “cone of darkness”. Drifting out of range of habitat, Ω, Mars once again reenters “cone of darkness”. 60° separation. All these 60° “pie slices” can form equilateral triangles (with Sun at common apex) if one imagines lines directly between defining points. This notion works for outer orbit (points 1 through 5) and for inner orbit (points such as α, Earth and Ω). Recall with dimensions as shown; thus, all three legs have same length, orbit radius. triangle. Thus, straight line distance between points: 1 to 2, 2 to 3, and so on is 1.5 AU, same distance as from Sun to Mars. Similarly, straight line distance from Omega to Earth, Earth to Alpha, and so on is 1.0 AU. Assuming co-planar orbits (not quite true, orbit of Mars is slightly askew from orbit of Earth, ecliptic), straight distance between cata-corner points (i.e., points 1 and α as shown) is 1.32 AU. 45°/0.475°/day = 94.78 days; approx. 95 days. 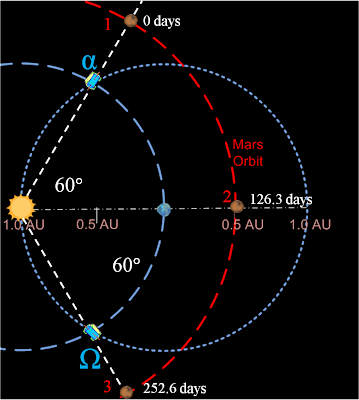 Thus, synodic duration from angular distance 45° prior to Earth's conjunction with Mars is about 95 days; same duration would apply to 45° after conjunction. CONCLUSION. Thought experiment conjectures that the network of Terran habitats might very well interact directly with Martian habitats, one Enterprise conducting commercial transactions with another Enterprise.